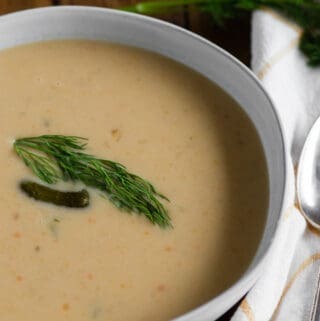 Dill Pickle Soup is a comforting creamy potato soup recipe with just the right amount of dill pickle flavor to make it interesting! 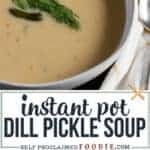 You can make this easy dill pickle soup in the Instant Pot (my preference), on the stove top, or in your slow cooker. This flavorful soup is perfect on its own or can be enjoyed with some crusty bread or a grilled cheese sandwich. I had never even heard of dill pickle soup until just a few years ago. I feel like I’ve missed out on decades of deliciousness! Fun fact: Did you know that I didn’t like pickled-anything until I was pregnant with my first child? Now I can’t get enough. And now that I have my own garden, I look forward to making my own pickles each summer. What does Dill Pickle Soup taste like? If you do a quick search online, you’ll find a lot of variations of this dill pickle soup recipe. I have to be honest – some of the recipes out there look rather unappetizing in my opinion. I think soup should be thin enough that a spoon is necessary. I can’t stand soups and chowders that are either super thick or have huge chunks of potatoes. So, when I was developing and testing this recipe, my goal was to have a light, creamy, semi-thin soup with a subtle taste of dill pickle. 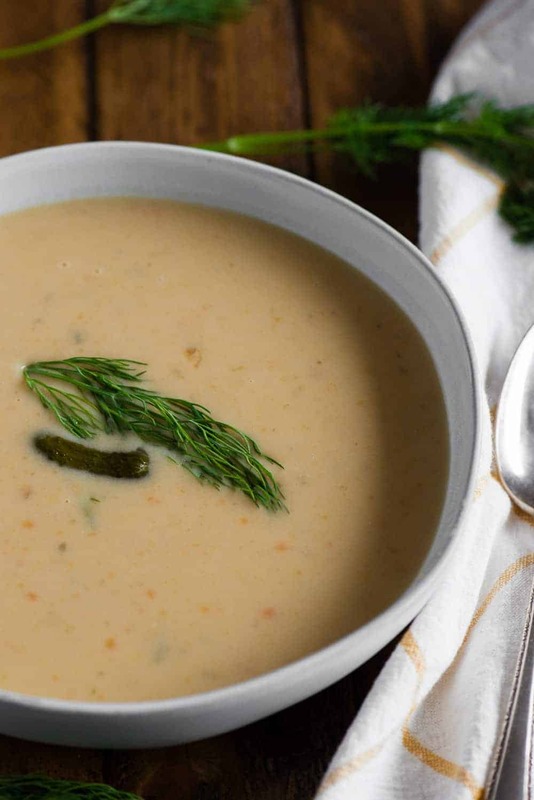 My dill pickle soup tastes very similar to a potato leek soup, however the addition of the pickle gives it just the right amount of salty pickle tang with some added texture. This soup is mostly creamy but there are tiny little chunks to make it interesting. What is the origin of Dill Pickle Soup? Although this recipe, much like everything else I’ve made, has been heavily Americanized, the origin of pickle soup is said to come from both Russia and Poland. In Russia, they make a sour soup that contains pickle brine. Likewise, you can find traditional Polish dill pickle soup that is also prepared with Polish style pickles. Either way, basic Dill Pickle Soup starts with the primary ingredients of broth, pickles and potatoes. I just add more good stuff to make it even better! I make my dill pickle soup, along with most other soups, stews and chili nowadays, in my Instant Pot. I just find it to be the easiest method with the best flavor. If you don’t have an electric pressure cooker, I detail in the recipe below how to also make my pickle soup on the stove top or in a slow cooker. I start this soup recipe by sauteing onion, carrots, celery, and garlic in butter. That is the base for just about every soup I make. I use a lot of butter in this recipe. I make no apologies. Next I add peeled potatoes, chicken broth, a bay leaf, chopped pickles, and pickle juice (or brine). I cook that mixture until the potatoes are very tender and then I remove the bay leaf. At this point I like to partially blend the soup. I don’t want it completely smooth as I find small chunks very pleasing. To do this, I think an immersion blender works great, but you can also add half the soup to a counter blender and blend until smooth. Finally, I stir in some heavy cream to make my dill pickle soup extra rich and creamy along with some fresh dill. Be sure to taste and add more pickle juice and/or salt and pepper, if needed. How long is Dill Pickle Soup good for? If you have leftover soup, store the leftovers in the fridge and be sure to eat it within the next 3-5 days or so. It will probably last even longer, but if I don’t plan on eating leftover soup within the next couple of days, I usually freeze it right away. 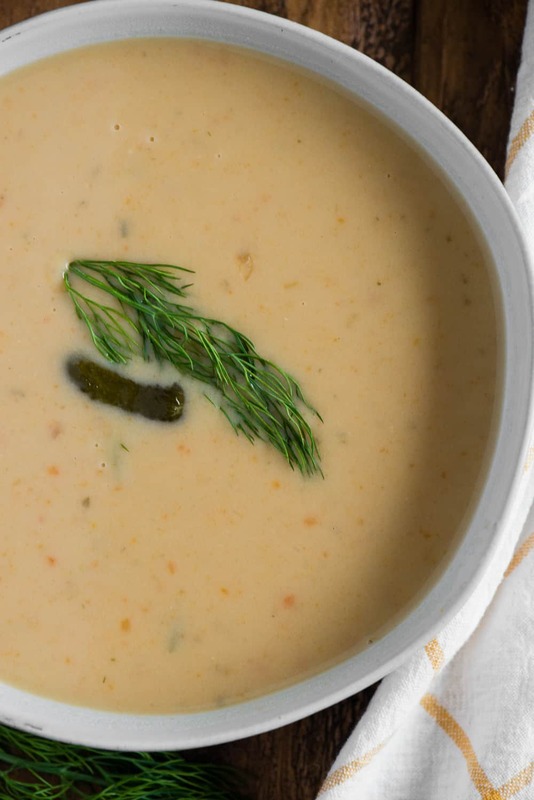 This dill pickle soup is excellent for freezing. I simply cool it in the refrigerator first, then I add it to plastic reusable quart sized containers where I keep them in the freezer. I always love to have homemade soup on hand! Pulse onion, carrots, celery and garlic in food processor until the pieces are less than 1/2 inch. Alternatively, dice veggies into small pieces. Set aside. Separately, chop potatoes and rinse with cold water. Melt butter on saute mode. Add onion, carrot, celery, garlic mixture and allow to cook, stirring only to prevent burning, until slightly golden brown. About 5 minutes. Add potatoes, broth, bay leaf, pickles and pickle juice. Close lid and cook on high pressure for 12 minutes. Quick or natural release the pressure. Remove Bay leaf. Melt butter in heavy bottom stockpot. Add onion, carrot, celery, garlic mixture and allow to cook, stirring only to prevent burning, until slightly golden brown. About 5 minutes. Add potatoes, broth, bay leaf, pickles and pickle juice. Bring to a boil and then reduce heat to maintain a simmer. Cook until potatoes are very tender, about 30 minutes. Remove Bay leaf. Melt butter in heavy bottom stockpot. Add onion, carrot, celery, garlic mixture and allow to cook, stirring only to prevent burning, until slightly golden brown. About 5 minutes. Transfer to slow cooker and add potatoes, broth, bay leaf, pickles and pickle juice. Cook on high 1-2 hours or low 4-8 hours. Remove Bay leaf. Use an immersion blender to partially blend while still maintaining some chunks. Alternatively, you can add about half the soup to a blender and blend until smooth, then combine with remaining soup. Stir in heavy cream and fresh dill. Taste and add additional pickle juice and/or salt, if needed. I totally have to try this soup. Sounds so amazing!!! OMG this was SOOO Good! It is now on my soup rotation list forever!! I’ve totally been missing out on this soup too! Looks so easy to make using the instant pot. This will be perfect with sandwiches later this week!! thanks! Amazing pictures. Thank you so much for sharing, cannot wait to try this at home!